My actual cactus garden is up the road a little bit and is full of all sorts of prickly things. Thought I would swing by here since I'm a big fan of all cactus and many succulents. I'm finally getting around to starting my mother-plant patch, the location is well drained but the dirt was too rocky, shallow, and a real pain to run a water hose to, but the dirt is far from poor. Its right next to a gravel drive way and I tried to grow some spare pepper plants there in the past, didn't work out. Spread some wood chips around, lawn clippings, a year and a flood later (silt deposited! ), its rotted down enough to plant in. ~4" of good dirt. Collected a few pads from a cactus that is probably older than I am, some of them have been out here for as long as I can remember, attempted some grafting with the green ones and the old 12"+ one, was the start of my first mother-plant, but I have several now. Although they make fruit and I have tried some jelly/jam when I was much younger, food is only one of the many reasons to grow them. The primary reason is for security and a little extra deterrence along fences, but if I'm going to plant them on the entire perimeter, I need a lot of mother-plants to take cuttings from. I plan to keep starting these little patches, as well as continue to dig up the small ones that routinely get mowed over and from places they aren't doing well at. A nice fence can be snipped or jumped but three feet of thorn covered cactus is a little harder to get through, even with a machete! I try to pass around Opuntias on the webs as one of the best permiculture plants, especially if someone asks for cold tolerant cactus. I think some Opuntias grow as far north as Canada! Extra pictures! (remove space bar)! Entire garden, even the weeds, plagued!! Soil test results came back. No Potassium, magnesium, or copper, in the soil excess salts. I think the excess salts are from the nitrogen pellets 21-0-0. The troubled garden perked up a little bit after a fair amount of rain and at this point I'm letting it sit idle until the winter, weeds included. See attachments for page 1/2 of soil test. Treatment on page two: Leaching the salt off by drains or by deep watering. Treating with Humic acid & molasses also recommended on 4-6Wk schedule. Getting irrigation water tested is recommended. Soil inoculates are also recommended to fix atmospheric nitrogen. Treatment with sulfur as well to activate calcium and magnesium. Green sand will cover potassium, iron, etc, while leaching. Sulfur, copper, etc, can all be sourced locally. Epsom salt isn't mentioned in soil treatment, probably because salt levels are already excessively high and should be brought down before fixing magnesium. I may entertain going back to using Johnson grass hay as mulch or lawn clippings in my gardens. Its a question of if its worth giving copperheads another incentive to invade. Killed two more of them just a day or two ago, there is no shortage no matter how clean I and cut I keep my lawn, being in the middle of a forest. At least until I cut the forest down and keep the big oaks and broad leaves. Broad leaves compost well. I'm still crawling through .edu pages and the damage seems to fit somewhere between herbicidal damage(largely ruled out), foliage burn(excess fertilizers), and tip burn(Excess fertilizers / deficiency). Herbicidal damage doesn't fit, area is far too limited and localized within the watered area, and no one else is around to be spraying. The culprit list includes: burning from excess fertilizers, burning from nutrient deficiency, or disease. I have had end blossom rot on my tomatoes in the past, misshapen leaves (not to this extent), watermelons have also rotted just last year, so calcium levels are heavily suspect. Never had anything like this before. I will see what I can do about getting the soil tested professionally, otherwise I'm just guessing. I inspected my gourds and found little hair like worms munching on them, (leaf miners) I'll have to ruin their day in the morning after the storms pass. (BT / Dipel). However, I checked the beans and other plants and found no such worms. is pretty accurate as far as what the bean row looks like. I can't imagine herbicide drift but its possible, its so far limited to this one spot, drift would affect bullnettles and other weeds outside of the garden space. Many thanks for everyone taking the time to run through this with me and pop in suggestions. Its very sandy soil on a flood plain so I may grab a few bags of potash in one form or another... I can always use it on my bananas if its not the case. Seems walmart sells some cheap testing strips for NPK. I don't expect them to be very accurate but if its a major deficiency then it will show up. Many thanks... and if its not potassium.. there isn't much I can do I guess except wait until I can till everything under and keep it a winter only garden. I'm in the middle of nowhere and no one else around grows anything. If it were chemicals from the only two or so houses up stream, it would be diluted in 10s, of millions of gallons flushing by per minute. (Trust me, a lot of stuff got carried away with it.) I recovered most of it but my fancy wheelbarrow probably ended up in someone else yard. This whole thing is an enigma to me. The affected plants are all roughly within the diameter of my sprinkler, except for a few in my other garden. The same water is being applied to both gardens through similar methods (overhead). I thought it might be saline burn but it would have affected everything if that were the case. Nitrogen is added by free casting pellets across the tops of rows, with sprinkle to larger plants. I dabbled with mixing some in water and applying via sprayer but I killed my lemon thyme doing that. The same spray had no negative effects on anything else, so I guess Thyme plants are just delicate. Pity, I saved it from root rot earlier in the year. Bought another, its going fine. This situation was going on before dabbling with a liquid spray though. I've always free cast nitrogen and phosphate, on the rare occasion I add greensand, its directly to holes when planting. The trunk is whats left of last years growth so I don't go poking holes in the root bulb/knot thing in the spring while they are still dormant. Both the healthy and the unhealthy ones still have stumps, they will eventually break off the rest of the way for disposal and don't go below the soil / freeze line. I feed them several times a year with Chilated Nitrate(organic) and pelleted chicken manure, so nitrogen shouldn't be any issue. The critter on the bull-nettle is a common spider and there hasn't been any hail here in years. I can't imagine the sprinkler causing damage as it was hitting the trees directly last year with no signs of damage, not even yellow leaves. I didn't notice the leaf miners before... I'm going outside again tonight to walk my dog and I'll take a closer look at them. They don't solve the asparagus and Moringa trees though. In April of 2016, we had a 100 year flood and a month of rain afterwards but I don't see that being the cause since the summer and the rest of that year still saw vigorous growth, but I haven't ruled it out either. This year, nothing has any kind of vigor, except a few rows in the adjacent garden that so far has avoided this. On some plants its like edge rust, others are missing leaves or the leaves are deformed, followed by necrosis, etc, on others like the nettle it browns from the outer edge. Dill turns brown, asparagus browns, Moringa leaves curl inward and yellow at the edges first, then yellow and fall off. As far as I can tell, its limited to the leaves. I also have every pest known to man out here from swarms of leaf hoppers, stink bugs, shield bugs, squash vine borers, grasshoppers, snails, etc. No amount of pest control, weeding, etc, will get rid of them since I'm near a shaded water source and in the middle of a forest. However, they never caused any significant problems either. Crinkle virus is out and about but has only ever affected about five plants at most. I suppose I should say the only plants not affected are nut-grass(common name / weed), and collard plants. Eggplant seem fairly resistant to it. I used to. The mulch (woodchips) I still have lying around, have been used since last year and in both gardens, as well as newspaper. The woodchips I still have piled up (about 30 meter/yards away) are largely dark and composted. The other woodchips I used in spring of 2016 are from on-site when having electrical right-of-ways serviced(fresh). Most of them got washed away in the flood. . I shifted to Johnsongrass hay from the neighbor which had weathered too long being rained on and was unsuitable for feeding. I discontinued that when I discovered it was the perfect haven for forest lice, snails, millipedes, centipedes, etc. It did do wonders for the topsoil though! The remaining haybales are for compost use with lawn trimmings, among other things. I inevitably chopped some of the woodchips into the soil while weeding so a portion of two rows are a bit slow to grow, even with supplemental nitrogen, but they were never diseased. The last time I added any kind of mulch to the garden was sometime last year. Now all my mulch is sitting in a big pile away from the gardens and I'm probably going to use it as land fill for some of the weak spots on the levies or holes. I haven't seen anything on plant stems that would indicate bacterial cankers, its also not Southern Stem Blight which I've had problems with in the past (pretty much why I don't plant peppers anymore). 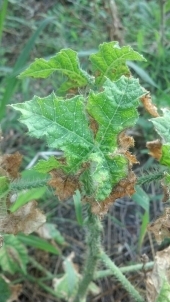 One of my gardens has fallen under some kind of rampant disease and no amount of googling seems to be able to identify it. This stuff is killing / stunting absolutely anything it gets onto from my Moringa trees, peppers, to beans, tomatoes, dill, even the bull-nettles are sick! It severely stunts the growth of anything it touches. I believe it started on cilantro and spread like fire across the entire garden, even the asparagus is sick! It isn't the typical brown leaf or spot either, they go from being green to straight into putrid rotting, no inbetween! I've tried keeping the weeds out, drying everything out, this stuff is in the dirt and crawls right back up. Even the raspberries are brown sticks now! The garden is watered by a single sprinkler head. I have a plot directly next to this one, about 12 feet separation that uses the same water source but with misters and tapes, so far whatever this is only affects a corner of that one. So far I can only determine that its spread on contact and through watering. This is going into JUNE, everything dries out and there is no standing water on the plants. winter crops, like swiss chard, broccoli, collards, etc, don't seem to be affected so if nothing can be done, it will be turned into an exclusively winter garden. What Happened??!? What do I have to do to fix this and stop it!!? I would have already fallowed the plot under save for the trees and asparagus but its shared with a family member and they won't allow that! The only thing I can think of deficiency wise is calcium or zinc since the soil is sandy and I've had end blossom rot on tomatoes in past years. But deficiencies don't spread on contact! Why can't life just be simple?